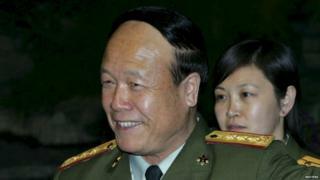 Former high-ranking Chinese army figure Guo Boxiong has been expelled from the Communist Party in a corruption probe. Action against Gen Guo had been expected for several months, following the downfall of two other senior military figures with whom he served. Gen Guo is accused of using his influence to seek promotions for others and of accepting bribes. President Xi Jinping has led a major anti-corruption campaign since taking office three years ago. The downfall of such a senior and well-connected military figure as Gen Guo is yet another significant victory for Mr Xi but also sends a warning that his anti-corruption campaign is by no means over, the BBC's China editor Carrie Gracie reports. Several veteran generals have complained that graft in the armed forces is so pervasive that it threatens the country's ability to wage war, and that promotions are often bought and sold rather than earned, our correspondent reports. Gen Guo served as vice-chairman of China's central military commission from 2002 to 2012 and was a member of the Politburo. His case has now been handed to military prosecutors. His son, a navy admiral, was also detained earlier this year. The other two generals that Gen Guo served with, Xu Caihou and Gu Junshan, were accused of corruption on a huge scale. State media reported that it took a week to catalogue all the cash, jewels and antiques amassed in Gen Xu's Beijing residence and that 12 trucks were required to remove them all. He died of cancer in March. Gen Gu meanwhile was responsible for logistics which allowed him to embezzle $5bn (£3.2bn) in the process of military real estate transactions.